Make time to write down your conversations with God! Try it for ninety days, then go back and reflect upon what God has said to you in His Word, and through the Holy Spirit. Revitalize your relationship with Jesus Christ through this dynamic combination of a daily devotional and journal, by writing notes and recording prayers concerning your day-to-day living with Jesus Christ. Know that His love for you is great, and a record of conversation will inspire you to do what God says to do. It could be in the writings that you discover your purpose and calling: “You can make plans, but the Lord’s purpose will prevail” (Prov. 19:21, NLT). Get up early each morning and write down your thoughts; make plain the vision for your life as the Lord of Life, Jesus Christ, the one who died on the cross for your sins, reveals what you need to do for that day. Before you start each day, remember to pause, talk with God, and record your impressions. Your life will begin to change right before your very eyes, and people will notice the Christ in you more than they notice you. 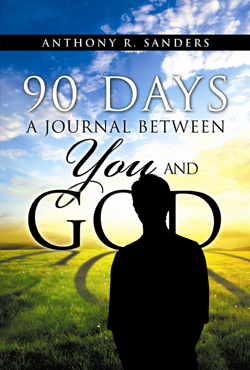 Learn to follow Jesus as a true disciple through the helpful hints on having faith, living with favor, and believing for your healing, all of which are included at the end of this ninety-day devotional and journal between you and God. After all, when all is said and done, what really matters is your relationship with God through Jesus Christ, how you live to please Him, and serving and loving others unconditionally. Available online at www.xulonpress.com and www.amazon.com. Also available in hardcover, and coming to other online venues soon. You can go to any bookstore and place an order. I think this is a wonderful way for me to grow closer to God. I am going to take the 90 day journey. I’ve been searching for a way to enhance and deepen my spiritual journey with God, other than going to church and relying on other people to lead me. I’m so thankful I found this link. I’m sure it was God leading me. Thank you, for being here.